Changes To Title X Family Planning Program Facing Legal Challenges The Trump administration has finalized new rules that bar federally funded family planning clinics from referring women for abortions. Abortion-rights supporters call that prohibition a "gag" rule. 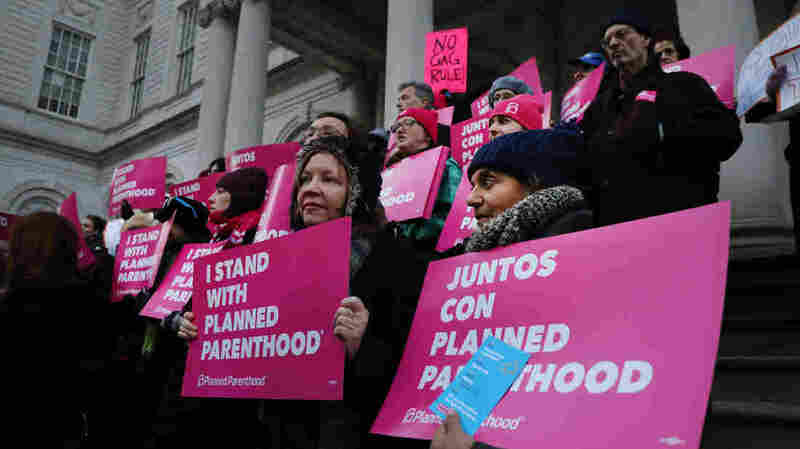 Abortion-rights activists, politicians and others associated with Planned Parenthood gather for a demonstration against the Trump administration's Title X rule change on Feb. 25 in New York. Multiple lawsuits have been filed opposing the new rule. Days after its official publication, a new Trump administration rule dramatically overhauling the federal Title X family planning program is facing multiple legal challenges. Several medical and reproductive rights groups, as well as 21 state attorneys general, have filed lawsuits challenging the rule, which bans any organization that provides or refers women for abortions from receiving funds through the program to provide services such as contraception and STD screenings. The latest lawsuit, filed Wednesday by the Center for Reproductive Rights, aims to block what abortion rights advocates are describing as a "gag rule." CRR is filing the suit on behalf of Maine Family Planning, the sole Title X grantee in Maine. "Taking the rug out from under them will basically decimate them," Emily Nestler, senior staff attorney for CRR, said in an interview with NPR. "And because they essentially are family planning services in Maine, will really decimate family planning services throughout the entire state, not to mention dramatically cutting back access to abortion." Nestler said the Maine group, which provides abortion services as well as family planning, heavily relies on Title X funds to serve patients across the largely rural state. Because they essentially are family planning services in Maine, [this rule] will really decimate family planning services throughout the entire state. The new rule, first proposed last year, is popular with social conservatives who have long campaigned to cut public funding to Planned Parenthood. Federal funding for abortion is already illegal in most situations, but many abortion-rights opponents have cheered efforts by the Trump administration to redirect funding for family planning services to organizations that do not provide or refer patients for abortions. Reproductive rights groups argue a dramatic shift in the Title X program could devastate networks that provide reproductive health care, including contraception, for low-income people. The filing by CRR follows a pair of related suits filed in federal court in Oregon this week, one by Planned Parenthood and the American Medical Association, and another by the group of 21 state attorneys general. They argue the rule is unconstitutional and interferes with doctor-patient communication in a way that violates federal law, including the Affordable Care Act. Announcing their suit in a conference call with reporters on Tuesday, Planned Parenthood's president, Dr. Leana Wen, said the rule compromises the ability of health care providers to provide full and accurate information to their patients. Wen has said that Planned Parenthood, which serves about 40 percent of Title X patients nationwide, will not be able to participate in the program if the rule stands. "We are fighting back on behalf of our patients and the ability of our doctors, nurses and health care professionals to practice compassionate, ethical and evidence-based medical care," Wen said. The National Family Planning and Reproductive Health Association has announced plans to file its own suit in the coming days on behalf of its member clinics in conjunction with a clinic in Washington state. On Monday, Essential Access Health, which administers Title X grants in California, announced a lawsuit challenging the rule on behalf of patients in that state. The legal battle could be a tough one, as Julie Rovner of Kaiser Health News has reported, because the Supreme Court has upheld similar rules in the past. But reproductive rights advocates believe the legal landscape has shifted over nearly three decades, and they're optimistic challenges to the Trump administration rule will prevail. In a statement this week, Marjorie Dannenfelser of the anti-abortion rights group Susan B. Anthony List said, "Planned Parenthood's allies are running to court to ensure taxpayers are forced to continue filling the coffers of the abortion industry" and called for "disentangling taxpayers from the big abortion industry." Unless a judge blocks the new rule, it's set to take effect in a little less than two months.